The tart and tangy grapefruit (Citrus paradisi) is a medium to large-sized citrus fruit that is related to the lemon, orange and pomelo. First described in Barbados in the eighteenth century, grapefruit was originally referred to as "the forbidden fruit." Commonly eaten for breakfast, grapefruit is a highly nutritious fruit and a good source of vitamin C and antioxidants. The grapefruit comes in a wide variety of shapes, sizes and colors. The light-yellow 'Whitney Marsh' grapefruit has a smooth-textured surface and a medium-thin rind. This round grapefruit is approximately 3 1/2 to 4 3/4 inches wide. The 'Whitney Marsh' has a pale, juicy, well-flavored flesh and few or no seeds. These grapefruits ripen late in the season, ship well and are easily stored. The tree is a large, vigorous, rapid-growing tree that thrives in hot climates. The juicy flesh of the 'Star Ruby' is a deep-red blush color that is considered the darkest in all grapefruits. It has few seeds, a yellow, smooth rind and is small in size. According to the University of California Riverside, the 'Star Ruby' is difficult to grow and is more prone to disease and pests than other grapefruit varieties. The trees are slow-growing and require consistent exposure to heat and humidity. 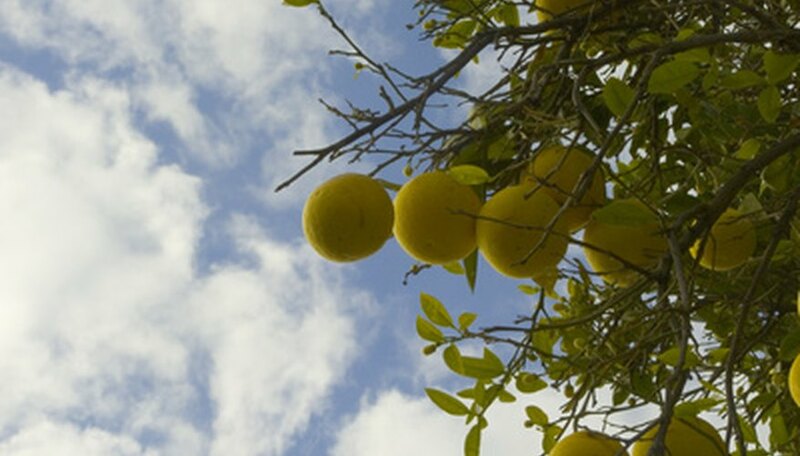 Found growing in Florida in 1830, the 'Duncan' is thought to be the oldest variety of grapefruit tree grown in the United States. The round fruit has a smooth, medium-thick, pale yellow rind. The flesh is light yellow, seedy, good-flavored and juicy flesh. The 'Duncan' grapefruit is approximately 3 1/2 to 5 inches wide. The trees are tall, sturdy and have a high heat requirement. The medium-large 'Hudson Foster' is a sphere-shaped grapefruit that has an abundance of seeds and a yellow flesh laced with undertones of pink and red. The flesh is juicy and has a sour, tart taste. The rind is medium-thick and smooth in texture. 'Hudson Foster' grapefruit trees produce a crop during the earlier part of the season and are hardy, vigorous, rapid-growing trees that thrive in warm climate conditions. The 'Oroblanco' is a hybrid variety of grapefruit that is a mix between a white grapefruit and a pumelo. The fruits have a mildly-sweet flavor and are greenish-yellow in color. The base of the fruit is flattened and the smooth-textured rind is thicker than most varieties of grapefruit. 'Oroblanco' grapefruits have a tender, light yellow, seedless flesh. The large, spreading tree is hardy and tolerates temperatures as low as 30 degrees F.